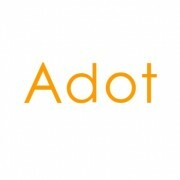 The One LED pendant light from Adot Lighting presents a compelling design that makes contemporary residential and commercial interiors simply stunning. A minimalist styling emphasizing its clean yet timeless detail, the ultra-thin LED pendant light supports a graceful and stylist appearance that blends harmoniously into its surrounding decor. This unobtrusive suspension light fixture utilizes edge-lit technology to create a uniformly luminous surface for an unsurpassed illumination experience. 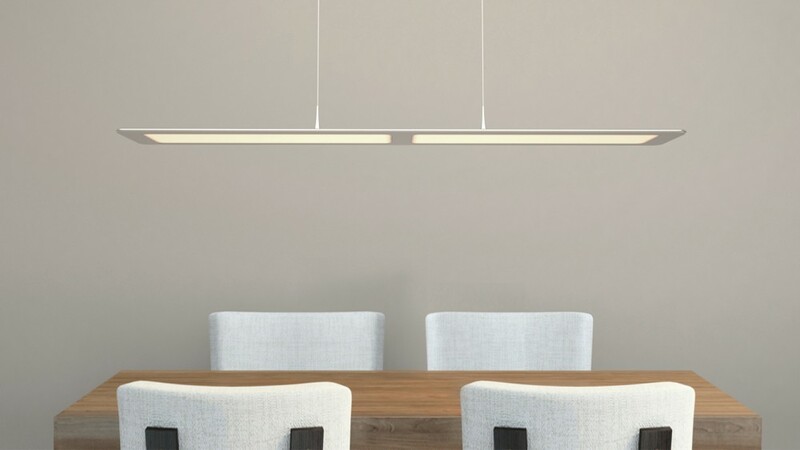 Premium lighting performance, visually uncluttered design and tremendous energy savings make this pendant an ideal contemporary lighting solution for island task lighting, dining room lighting, and countless commercial and hospitality applications. This edge-lit construction allows The One pendant light to reduce its thickness to a minimum of 6mm and create a slim, crisp profile. 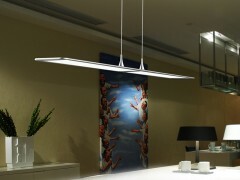 The ultra-thin pendant was created to draw attention only when it is switched on. It floats off the ceiling with an extremely clean look and minimal presence that introduce a spacious feeling that definitely heightens the impression of depth and dimension in even constrained spaces. The combination of opal white lensing and metallic silver finishing evokes a refined visual quality. Available in two sizes - 940 x 120 mm and 1200 x 140 mm, this linear light panel is designed to provide maximum longitudinal illumination coverage for optimal downward ambience over a dining table, kitchen counter or an office desk. Fully adjustable to the most convenient visual height (1200mm max. ), this flat pendant hangs from a rectangular metallic canopy which houses an off-board LED driver. The One is bound to delight room occupants with its pleasant ambience, the pendant provides impressive uniform light distribution across the entire span of its light emitting panels. High performance SMD LEDs are embedded along the edges of the aluminum frame. A laser printed light guide captures the light emitted by this side-mount LEDs and refracts it down towards a high-transmittance polycarbonate diffuser. By leveraging total internal reflection (TIR) to eliminate the shadowing and hotspots that direct-lit LED panels would experience, this pendant light provides totally uniform, smooth and visually comfortable lighting. Low glare, balanced light emission ensures that the pendant light does not overpower, distract, or irritate in modern living and working spaces where visual comfort is of paramount concern. The ultra-thin, low-profile LED pendant light delivers high performance and high reliability that allows you to reap the benefits of LED lighting for years to come. Lumiled LUXEON 3014 LEDs which are hot-color targeted at high temperature operating conditions deliver superior efficacy and color performance with superior lumen maintenance. 1/9th ANSI micro-color binning enables tight correlated color temperature control to ensure color consistency from LED to LED, and fixture to fixture. Laser etched PMMA light guide allows light to be transmitted uniformly across the panel with an exceptional light-extraction efficiency. Formed out of a single piece of machine-milled 5052 aluminum alloy, the sleek anodized aluminum housing possess high tensile strength and dimensional stability. Its excellent thermal conductivity and massive heat dissipation surface facilitates superior thermal management to optimize lumen maintenance and color stability of LEDs. Ultra-thin design allows the light to glow in stunning fashion. Best-in-class LEDs fulfil demanding color, performance, efficacy and reliability requirements. Well-maintained thermal equilibrium maximizes operating lifetime and minimizes performance degradation. Edge-lit optical architecture ensures homogenous illumination with no visible LEDs, hotspots, or shadows. High performance light guide maximizes light extraction.